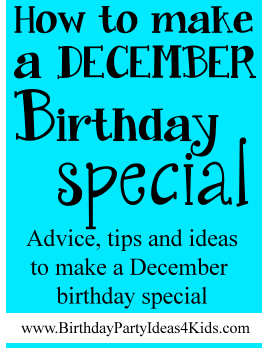 Making a Birthday special when it falls in December and especially near Christmas can be a challenge. Here are a few hints and tips from readers that can help make it less challenging. Separate the Birthday from Christmas. 1. Don't wrap birthday presents in Christmas wrapping paper. Don't even use solid red, green or white. Make sure it is birthday paper - bright and cheery. Don't scrimp and use Christmas bows on the present - splurge and wrap it up with tulle or fancy ribbon. 2. Put up birthday decor. A sign, banner, balloons, streamers and/or decorations will help separate it completely from the Christmas decorations. Try and set up one room with only birthday decorations (the kitchen or dining room) and leave the Christmas decorations out until after the birthday is over. 3. Make a birthday cake. Every child (and grownup!) loves to have their own cake complete with candles to blow out. Don't try and pass off a Christmas cake or pie as the birthday cake. 4. Don't give presents that are Birthday/Christmas presents. Remind family and friends that you are trying to make the birthday special and separate by not combining the two. 5. Give the Birthday Party a summertime theme such as a Luau or Day at the Beach to make it completely different then winter or Christmas decorations. Forget about Christmas for the day. Go out to dinner or the movies - make it a day of pampering or attend a special sporting event. Dress up fancy and have a wonderful night out to celebrate the birthday. The trick is to not do anything that involves Christmas on this day - no Christmas shopping, wrapping gifts, decorating the tree etc. Make the day completely about the child. If their birthday falls on the 24, 25 or 26th then try and celebrate a few days before their birthday. Some parents choose to have their child's party in November or early in December when school is still in session and friends can come to the party. Lots of children (and some adults I know) who have December birthdays celebrate what is known as a "half - birthday". While they still celebrate their birthday in December, they also get an extra party in June. If their birthday is on December 24th they would celebrate their half birthday on June 24th. It's a great way to make the child's birthday separate from the Christmas holidays. Make 1/2 a cake, wrap presents in only 1/2 paper, use 1/2 paper plates, play 1/2 of games, send out 1/2 an invitation ... just cut everything in half that you would normally do for a birthday. Fun birthday party ideas to celebrate a December birthday in June for their half birthday! A simple and easy ways to make kids who have birthday's near the Christmas holiday feel special.